once upon a while ago i wondered how to make a repeat pattern, the one that will duplicate into the same pattern at all right angles, the one used in weaving. the method was harsh (credits where credits due: tutorial from design*sponge), but i tried it anyway. with a little help from adobe photoshop, i succeeded in designing a repeating pattern. i'm curious for more at barbara's this weekend. Dear Nadine, I really love your owl pattern, not only the astonished look of this owl which looks a bit like an ol' woman with a headscarf but especially your trees are extremely awesome and unique. LOVE it. It works perfect as a pattern. I'm glad you like the link-thing. Have a nice weekend after your walk! This works great as a repeat and I love the artwork! i have never tried to create patterns like this... i will have to give it a try sometime. my mind is still a little confused, but i will follow your link. you clever girl. i'm going to have to try this now - even if it does crash my computer! 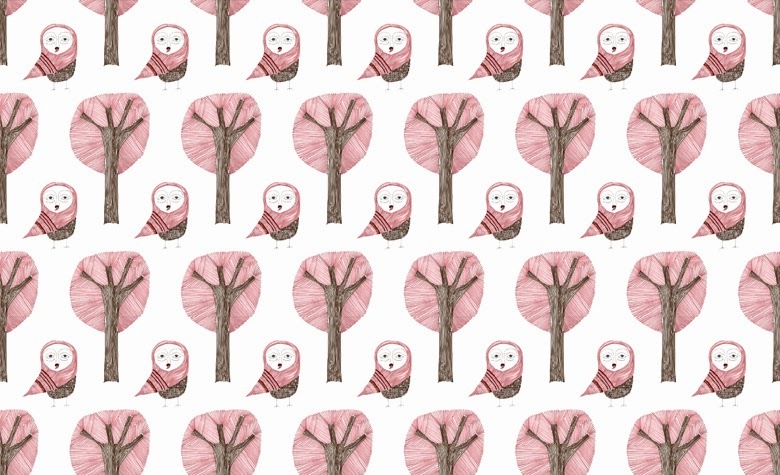 Nadine, I LOVE your owl and tree pattern! Will you make postcards with this design? oh, wow!!! i'm amazed at how your skills and talents improve each time you draw something! very nice - I love the tree! and the colors, of cause! Very cool pattern, I love the colors and the motive ! and your pattern, very, very NICE! wat fantastisch zeg, nooit geweten dat je op deze manier zo een patroon krijgt! i really like your woodpattern. and how you explane how to create a seamless pattern, too! this is so darling! You are really a great creator... will we find this beautiful pattern in your house one day? as wallpaper or/and fabric? Thank you even for the tutorial... I wanna try! and thank you for your help on my tentative blog. It feels good. Very well done, this is a beautiful pattern for a fabric! Ah, sorry, I forgot, no, I do not live near Patagonia, you know my country is quite large. I'm probably about 2000 kilometers from the place where the cave is. wow, wow, what a fabric this would make! Lovely autumn pattern! Imagine a cushion or a fine cotton scarf printed with this! Wow, this is wonderful! Like its simplicity and the colours!